(4 Customer Reviews) | Write Review 12 issues per year The official Liverpool FC magazine exists for one reason only: to provide everything that a Reds fan wants every month. As well as exclusive interviews and photography with current stars, it looks ‘under the hood’ of the club – providing access and insight for supporters that they just can’t find anywhere else – and tells the most compelling stories from LFC’s illustrious past. From Anfield to Melwood, world-class first-teamers to Liverpool legends, young Academy aces to the hotshots of the Ladies team, you’ll find it all here. The official Liverpool FC Magazine is one hundred must-read pages for every Red! 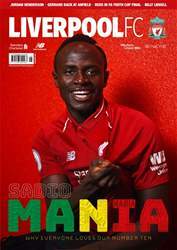 Issue 81 of the official Liverpool FC Magazine is packed full of interviews, features and fantastic images as we approach what is shaping up to be an exciting finale to the 2018/19 season. 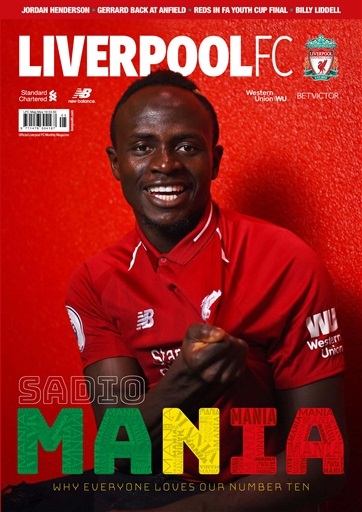 Inside we hear from Jordan Henderson and cover star Sadio Mane, who both assess the season's recent events, what's to come and more, while we also take a look back at our no10's first 50 goals for LFC after the forward passed the landmark during a prolific period in front of goal. Elsewhere, we have the story of another terrific LFC Legends match at Anfield, where a number of former stars entertained the packed crowd and helped raise money for good causes, we profile LFC's one-club men, and preview the FA Youth Cup final against Manchester City. All this and more is inside the May 2019 edition of the Liverpool FC Magazine, on sale now. The official Liverpool FC magazine exists for one reason only: to provide everything that a Reds fan wants every month. As well as exclusive interviews and photography with current stars, it looks ‘under the hood’ of the club – providing access and insight for supporters that they just can’t find anywhere else – and tells the most compelling stories from LFC’s illustrious past. From Anfield to Melwood, world-class first-teamers to Liverpool legends, young Academy aces to the hotshots of the Ladies team, you’ll find it all here. The official Liverpool FC Magazine is one hundred must-read pages for every Red! You'll receive 12 issues during a 1 year Liverpool FC Magazine magazine subscription. Great way for fans abroad to read the mag , and a quality mag at that!!! You'll receive 12 issues during a 1 year Liverpool FC Magazine magazine print subscription.